In an effort to expand the online conversation and create a dialogue with a broader demographic, Mayor Teresa Jacobs has invited key influencers to be Social Media Ambassadors during her signature annual event, the 2014 State of the County, held at the historic Ballroom at Church Street on June 6 at 8:30 a.m. The Social Media Ambassadors will join the online conversation on social media in the days leading up to and during the State of the County. 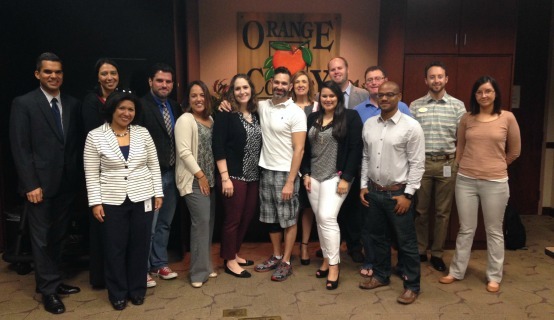 Orange County’s 2014 State of the County Social Media Ambassadors are influencers who have large followings on social media networks like Twitter, Instagram and Facebook. They will engage citizens in the social media conversation by sharing messages to increase public engagement and awareness regarding the Year of Transformation. Mayor Jacobs is the first sitting mayor in Florida to feature a Social Media Ambassador program in her State of the County address. Additionally, Google Glass will record and share live from the eyes of one of the Ambassadors. This is the first State of the County address in Florida to feature Google Glass. The projected reach and impressions according to our Social Media Ambassadors followers on Twitter alone is approximately 50,000. The campaign hashtags are #SOC2014, #YearofTransformation and #OCTransformation. Mayor Jacobs will also unveil a new and exciting way to connect with Orange County Government through mobile devices during her remarks. If you cannot attend the State of the County, the event will be televised live on Bright House Networks Channel 199, Comcast Channel 9, and AT&T U-Verse Channel 99, as well as live-streamed on www.orangetvfl.net and rebroadcast on Orange TV (same channels as above) on June 6. A variety of photos from the meeting are available for use by the media and are located on Facebook.